Ra603 St Ideuc K.V.U. Gruppe Festung St Malo, K.V.Gruppe Rance. Several occupied ports were made into Festung's, fortress's and defended by extra troops and guns. 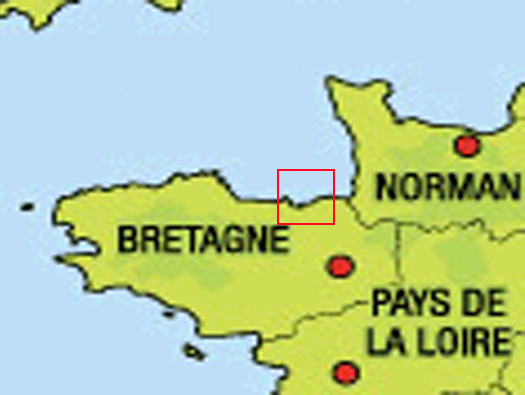 A ring of casemates circled the inland side of St Malo and continued around to Dinard. Ra603 is one of the northern Wiederstandnest (Wn's) facing inland. 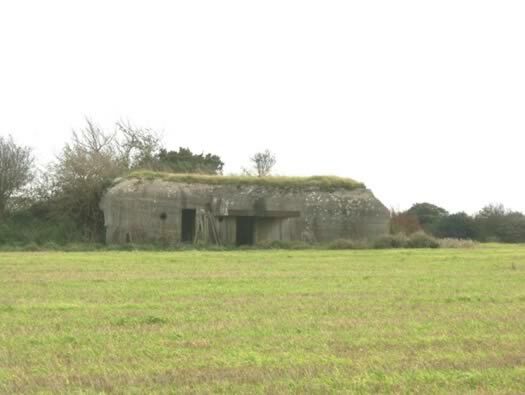 1 x R625/SK anti-tank gun bunker. 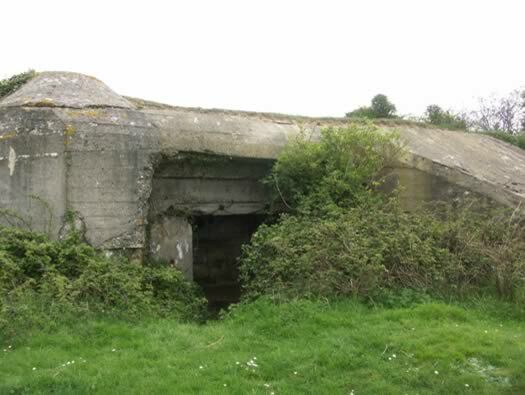 1 x R630 heavy machine gun bunker. 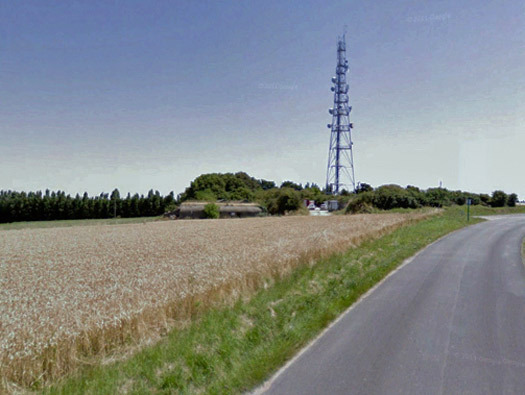 Easy to find, take the D355 from the last roundabout and turn left at the first junction and that takes you to the bunkers, also look out for a tall radio aerial. The ring of Wn's covering the inland were numbered 600series. This one is Wn Ra603. 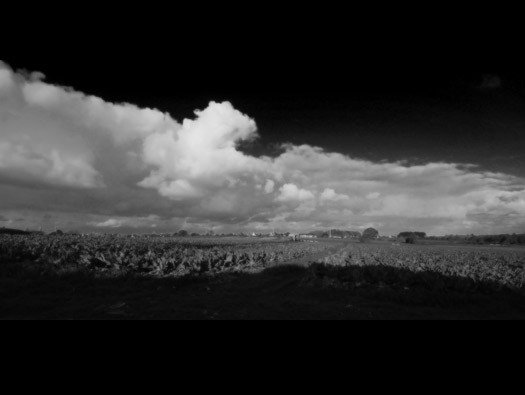 Between the Wn's were minefields, barbed wire and anti-tank ditches. 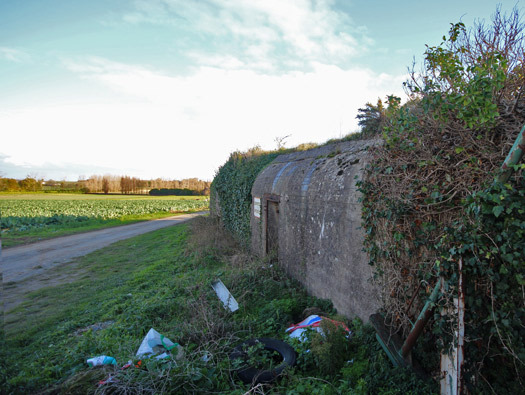 There were two casemates here an anti-tank bunker an R625/SK and an R630. An R626 with a Tobruk defence and a concrete wall going out from the middle of the casemate covering the gun room from a flanking shot. This model has its flanking wall on the left and no Tobruk defence. This is an R630 with its flanking wall and the one at Ra603 has no flanking wall. 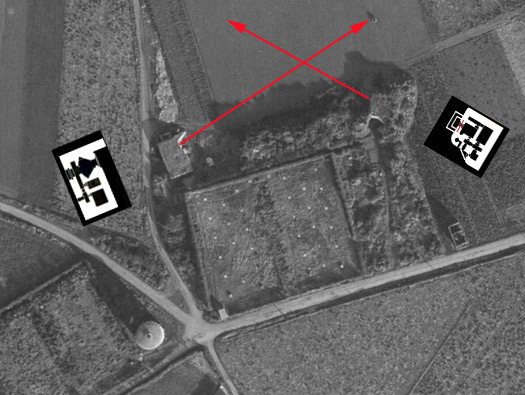 The Aerial with the Bunker to its Left. Rear of the R625/SK. Crew entrance on the right and gun room door on the left. 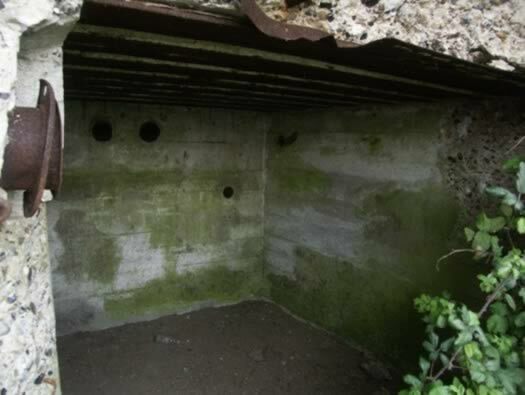 This is the gun room of an R626 casemate with no roof but it shows what it may look like inside the R625 above. 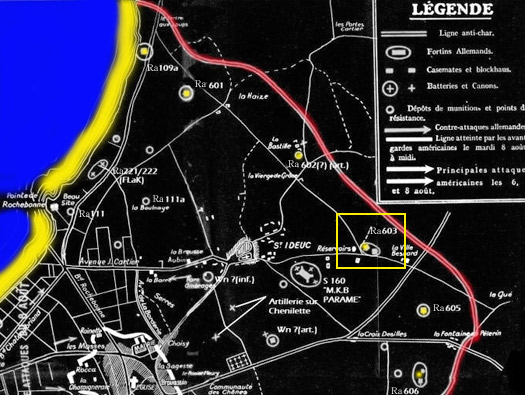 US Sherman tanks advancing on St Malo. 491p2 gittertur steel gate possibly closed off this entrance. This enabled the machine gunner inside at the close combat window to fire at attackers from the rear. Close combat defence window in use. There would have been a large steel double door closing off the rear protecting the their backs. Gun room for a 7.5cm Pak40 anti-tank gun looking in as best I could. An R677 gun room from the rear also looks very much like this one. Side of the bunker. I have no idea what this does, on a none S/K (Sonderkonstruction) type it too has a shape very similar on its left side?? R625S/K note the flanking wall on the far left side and not in the middle. This is as close as I can get to the embrasure as there is so much rubbish strewn around. Looking along the front line when the Americans attacked St Malo it would curved around to the far trees with belts of barbed wire and mines. 'S' mine (Shrapnel) or 'Bouncing Betty'. I do know that these were used on this front.All mines are nasty but this one bounced on contact and exploded at waste height. Ra603 St Ideuc Rear of an R630 at Maupertus, Cherbourg. As I could not get to the R630 I have added some details of what it would look like. 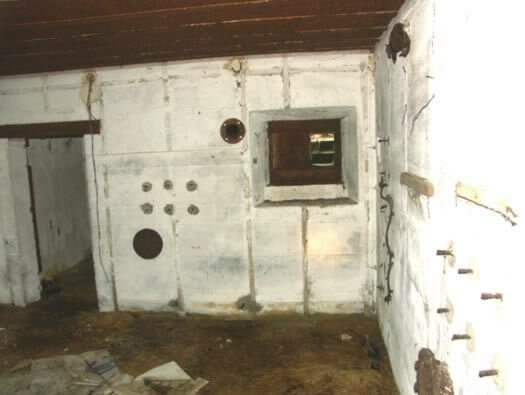 A crew of around four or five would live in this confined space with folding bunk beds that could hang from a chain and hook to the wall, three to four high, wooden cupboards, folding chairs and table. A small heater and an anti-gas filter pump. Bunker heater using coal or wood. Ra603 St Ideuc Rear of an R630 at Maupertus, Cherbourg. R630 at Maupertus, Cherbourg. 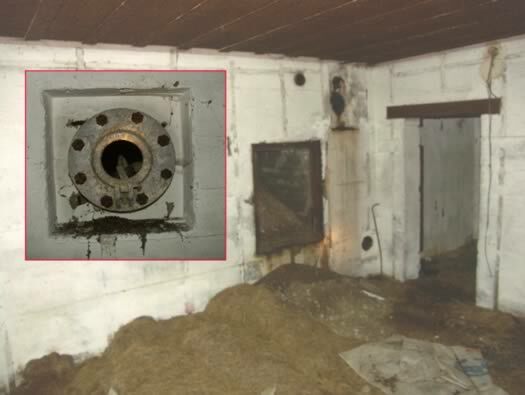 Here there is an escape hatch in the side wall and the sand on the floor is initially used to fill in the escape tunnel. When the door is opened the sand/gravel would be shoveled out and then escape. All very long winded and quite frightening. Inset is the equalising valve, if the pressure suddenly changes the valve opens. A 4ML01 type. A pair of bunker cupboards. 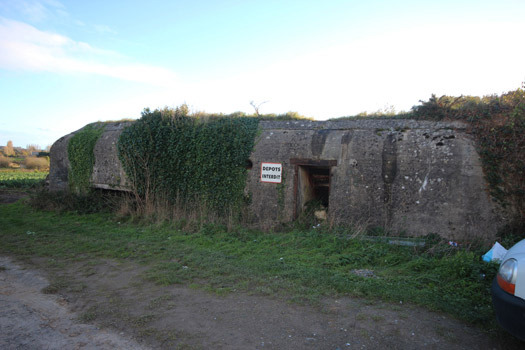 To the left is a small ammunition room adequate for many thousands of rounds of machine gun ammunition. The gun room would have had a large heavy steel plate bolted with several large steel nuts & bolts and a fitting for a heavy machine gun Mg34. A steel plate similar to this one would have been here. Gunner using his machine gun. Ra603 St Ideuc Rear of an R630 at Maupertus, Cherbourg. R630 at WiDie010, Dieppe.